Ever try to get your kids to eat boneless, skinless chicken breast and find it’s usually bland? You WANT your kids (and yourself) to enjoy chicken breast because it’s so healthy, filled with lean protein and low in fat. You could bread and deep fry it, but now you’re increasing the calories a lot. You could serve it with a high-sugar dip like BBQ sauce. Or a high-fat sauce like Ranch. But, YOU want your family to live a happy, healthy life so it’s important that your food is nutritious and not high in unnecessary calories. Read on to see the Mediterranean tips to make an EASY and delicious boneless, skinless chicken breast entree at home! Bite-Size Pieces – Large pieces of chicken taken a while to cook, making the outside tough and chewy in order to fully cook the inside. Bite-size pieces gives you a tasty sear and keeps each piece moist and juicy. Correct Salt Usage – Most home cooks under season their food, and without adequate salt everything you did previously won’t result in good-tasting food. 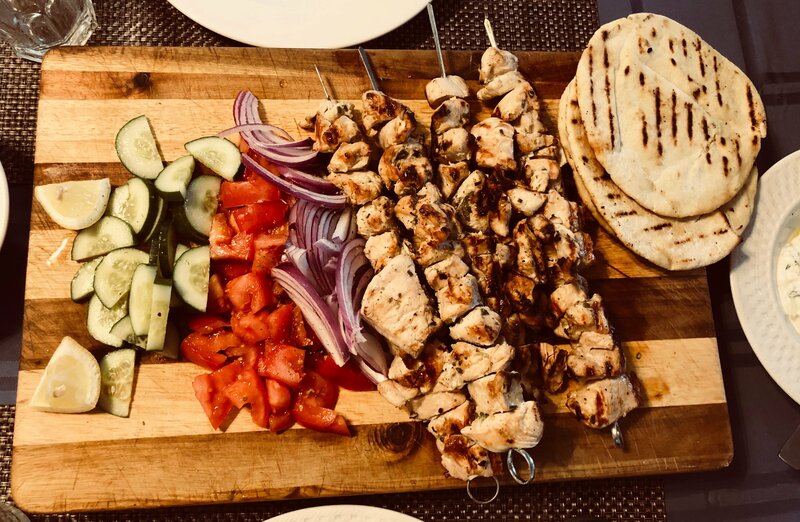 After learning from chefs in Greece I put together this marinade that packs classic Mediterranean flavors of Extra-virgin olive oil, white wine vinegar, fresh lemon juice, garlic, red onion, dried oregano and fresh herbs (Parsley, Thyme whatever you have). The below recipe is called “SoulvakI’ which Americans would think of as Shish Kabobs and involves grilling the meat with skewers. The day before (or morning of) whisk all of the ingredients except the chicken in a big bowl. Add the chicken and mix well. Cover with plastic wrap and refrigerate. Take out the chicken 20 minutes before you plan to cook and thread them on the skewer, adding the red onion between each piece to add flavor. Oil your grill by putting some oil on a paper towel and wiping the grill. Pre-heat for 10-15 minutes over medium-high heat. Add the skewers and cook for 2 minutes on each of the the four sides (about 8-10 minutes total). Cut into one large piece to make sure it’s fully cooked. Remove to a large serving plate and top with a pinch of salt, a drizzle of olive oil and garnish with Italian parsley. Let the chicken rest for 5 minutes before serving and you can grill your pita bread as you wait. Serve with lemon wedges, tomatoes, cucumbers, red onion and tzatziki! Chef Tip: To reheat chicken soulvaki, you can remove them from the skewer microwave them when you’re low on time, but it will make them tougher . Instead, put them wrapped in tin foil in an oven at 350F for 10-15 minutes until warmed through. Eat well, feed your children good food and get THEM involved in the cooking process so they can gain a lifelong skill.